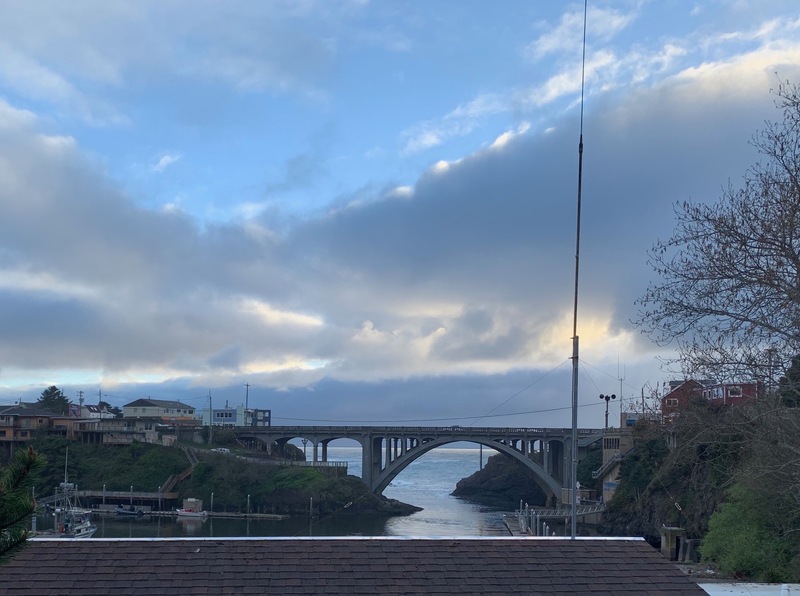 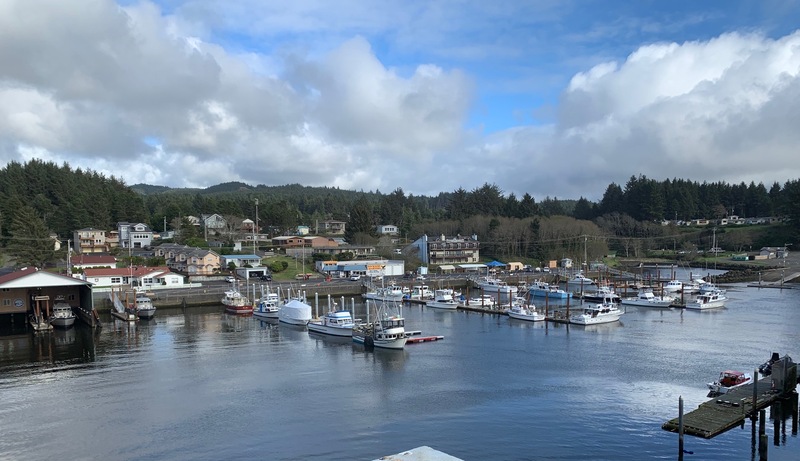 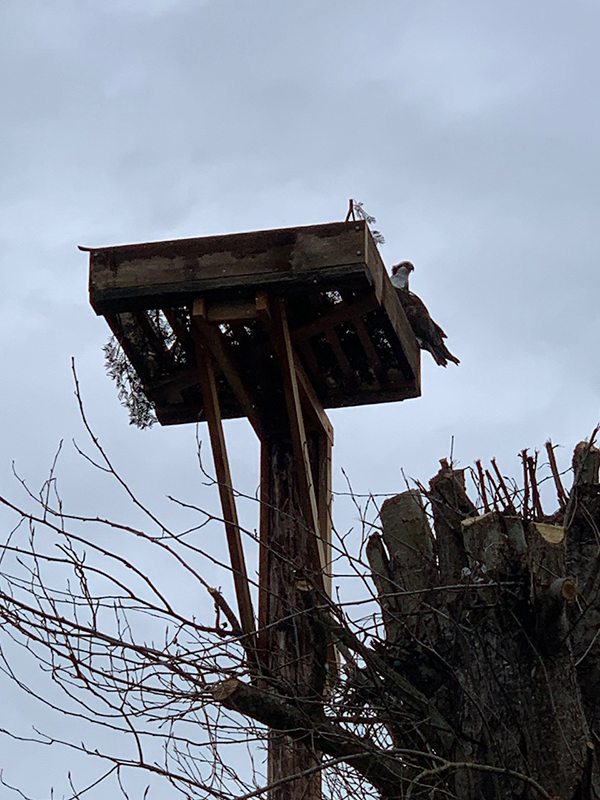 Today our birds returned to this very location for the fourth year in a row. 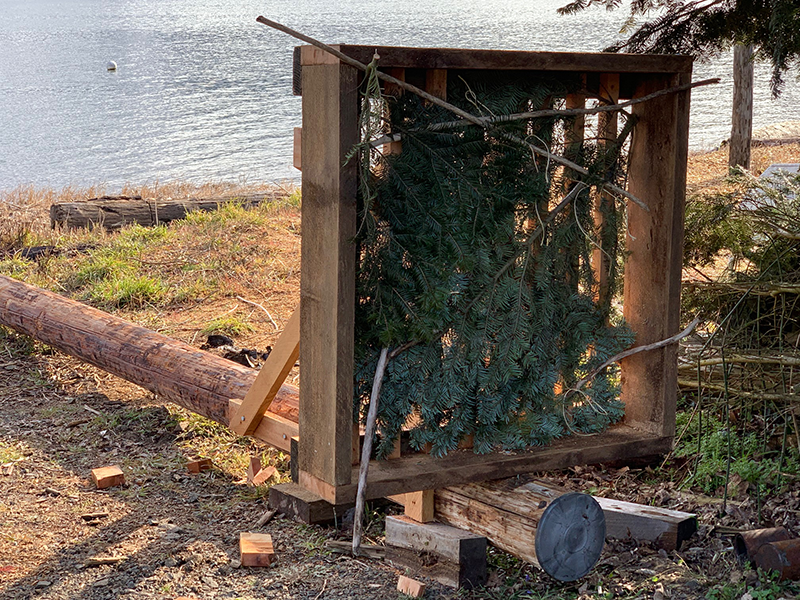 After the original platform I built years ago blew down in a big wind because the tree was so rotten. 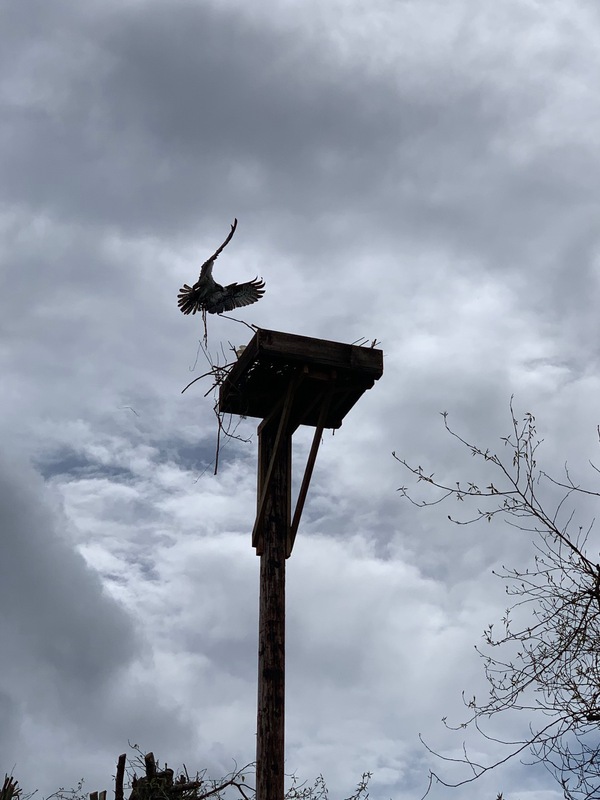 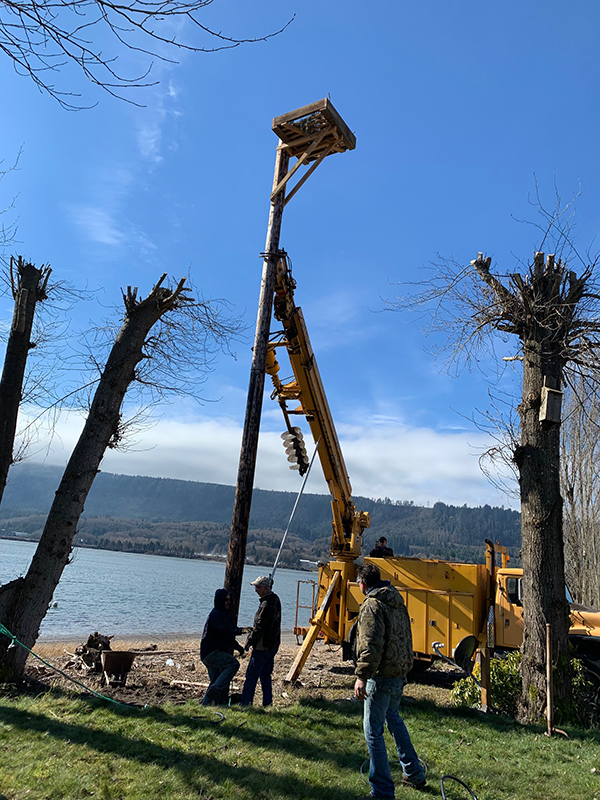 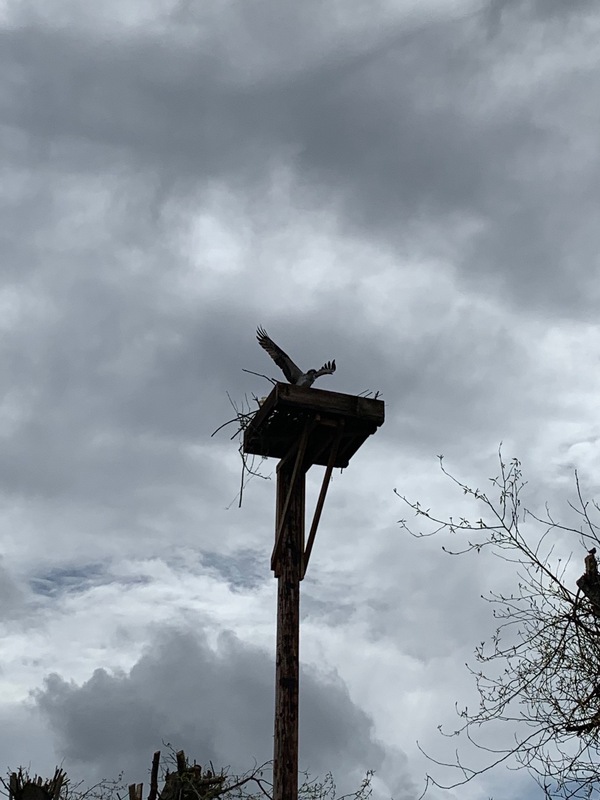 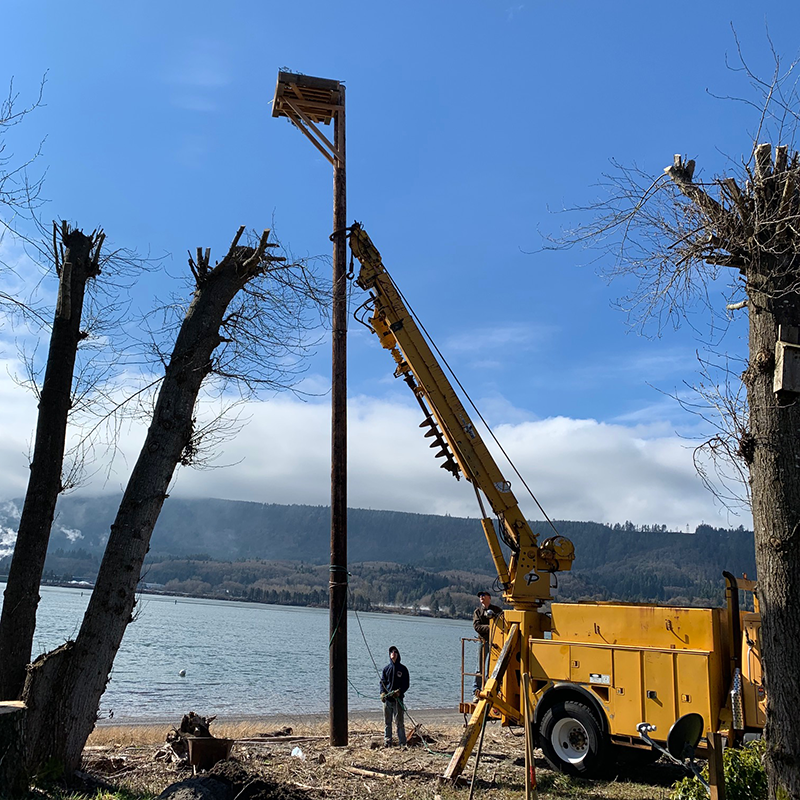 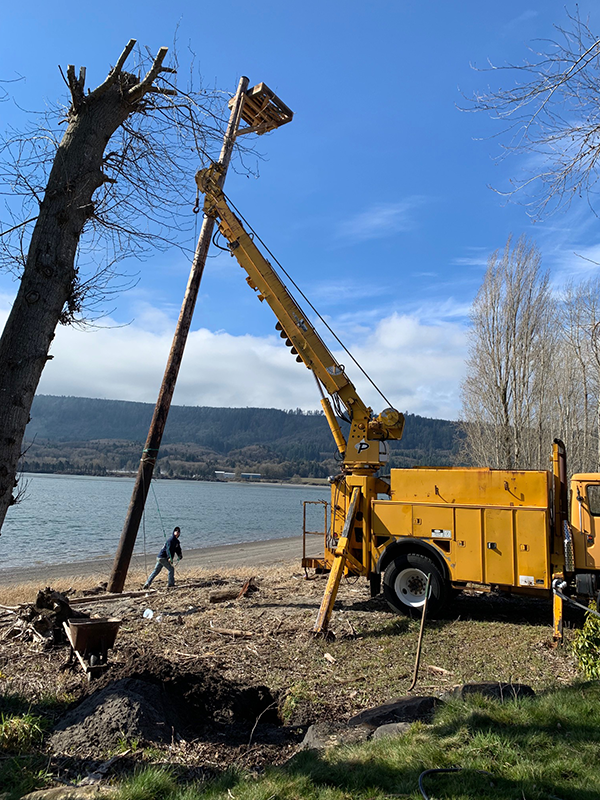 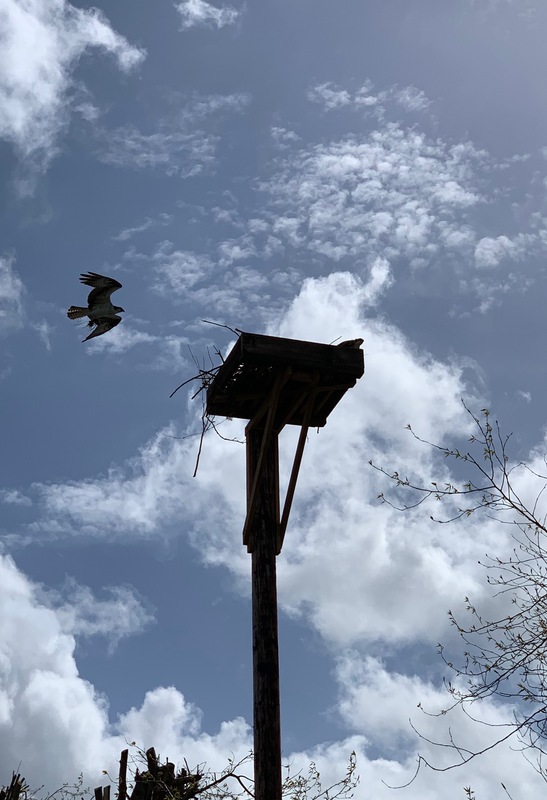 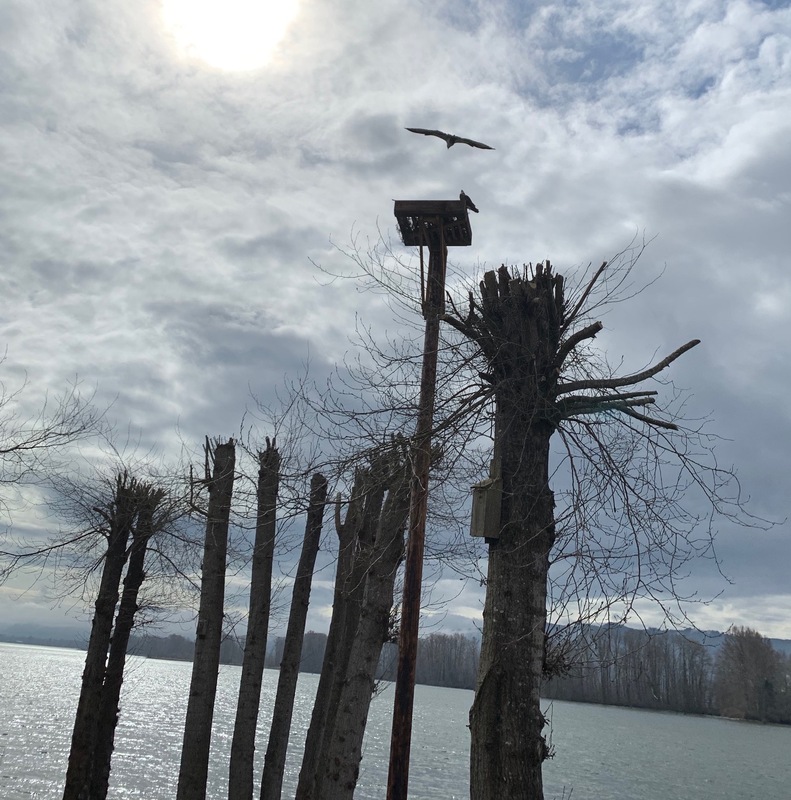 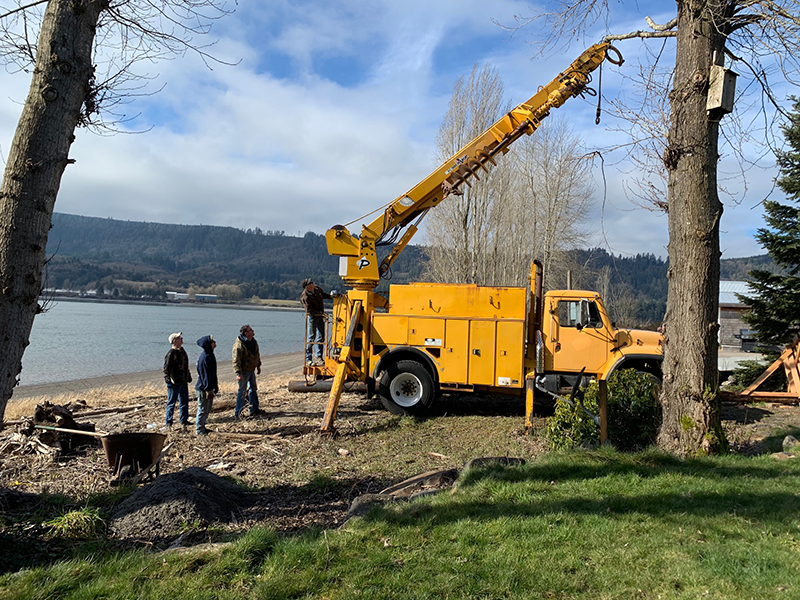 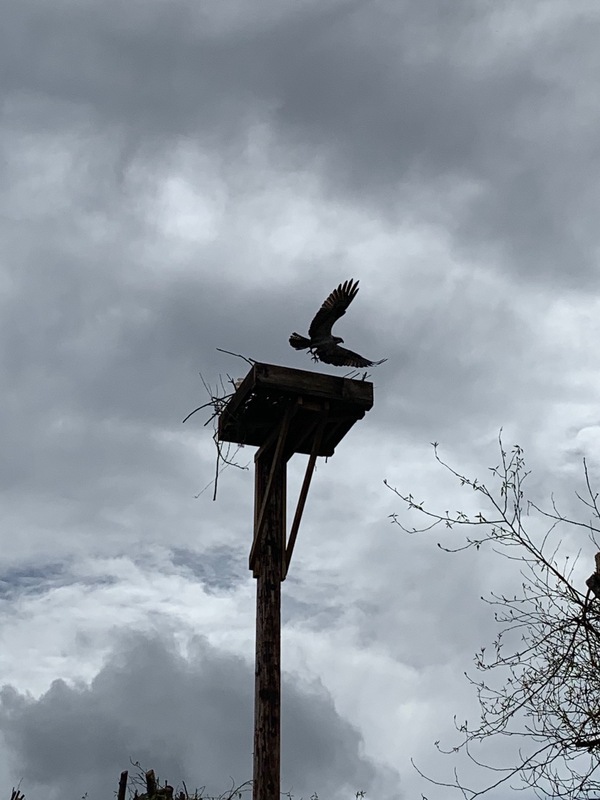 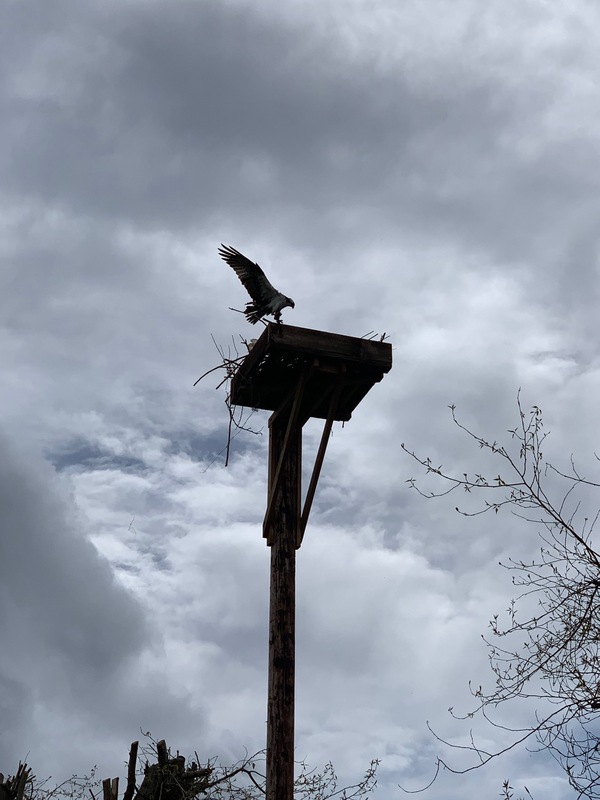 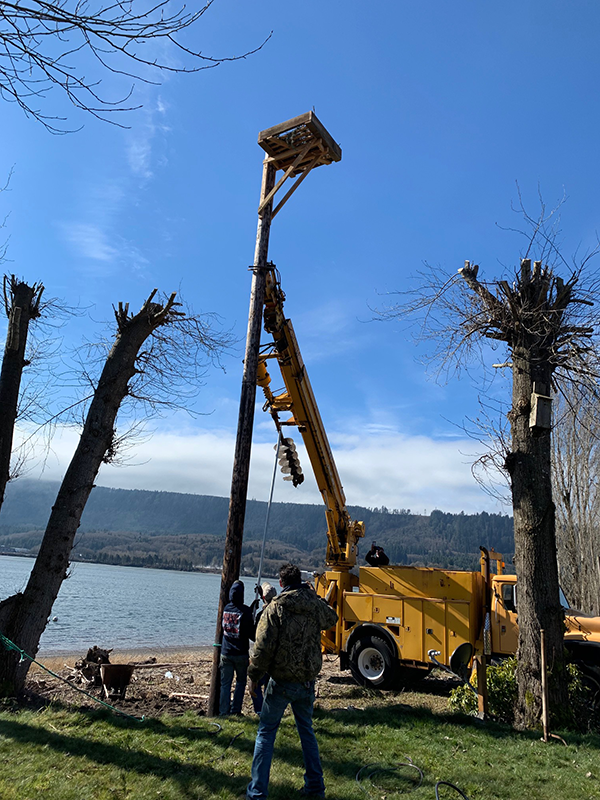 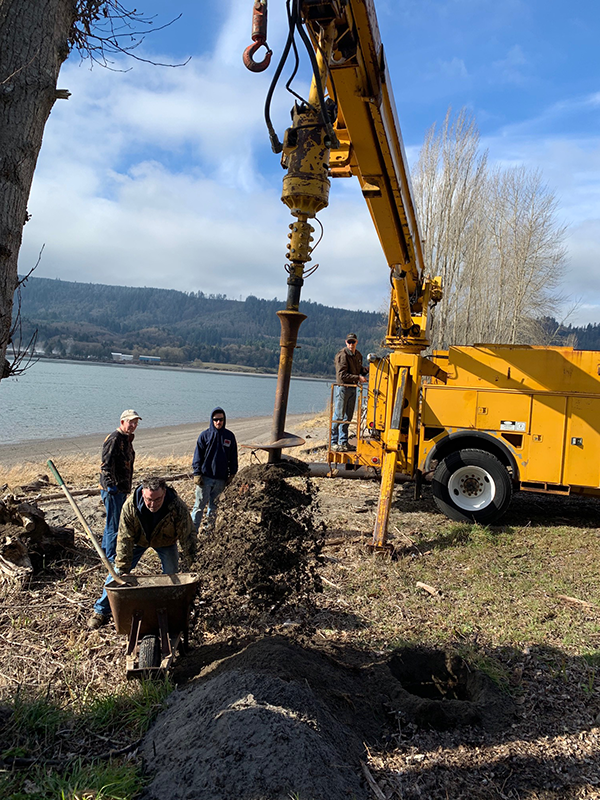 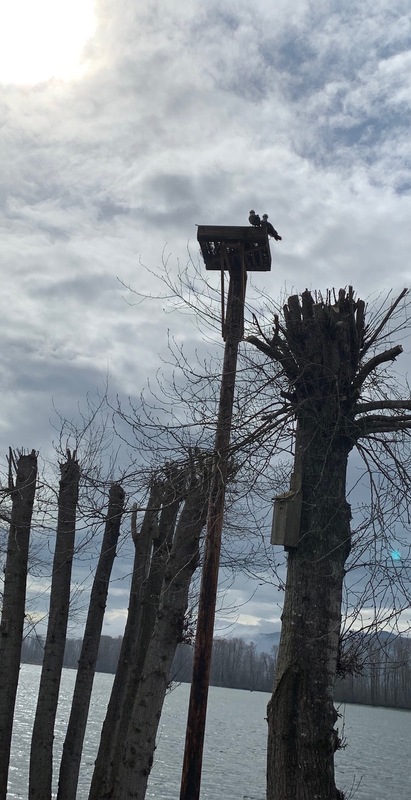 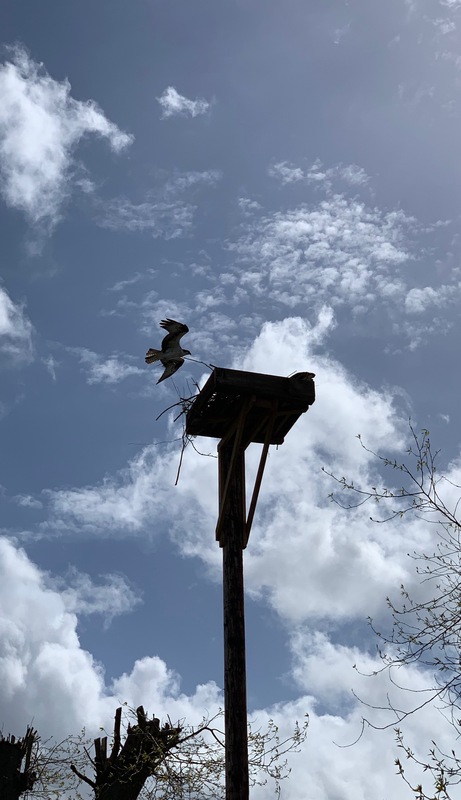 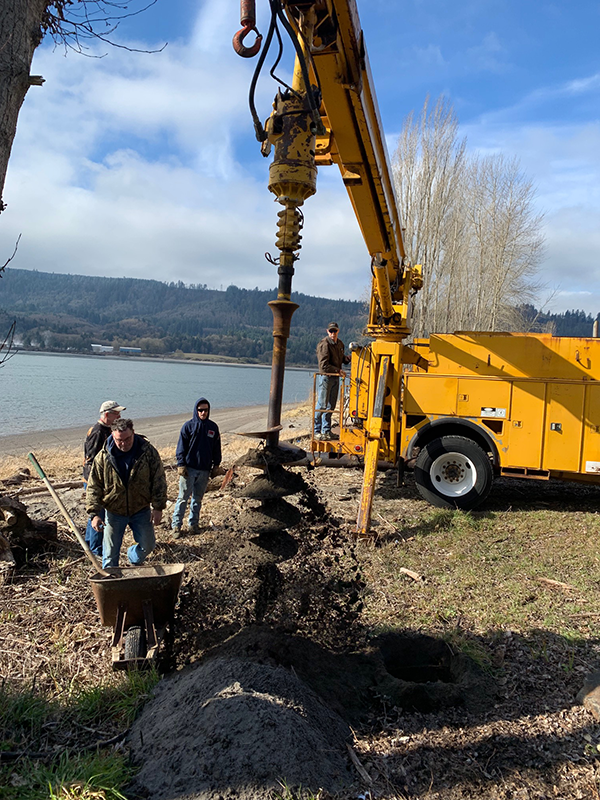 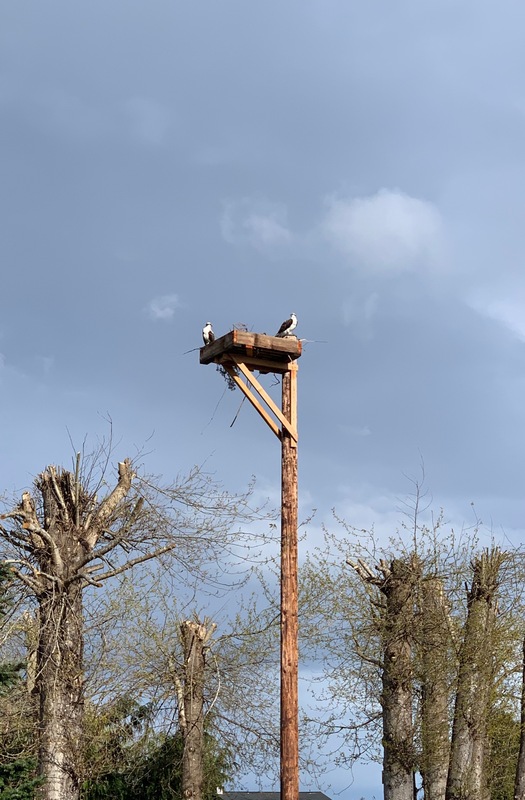 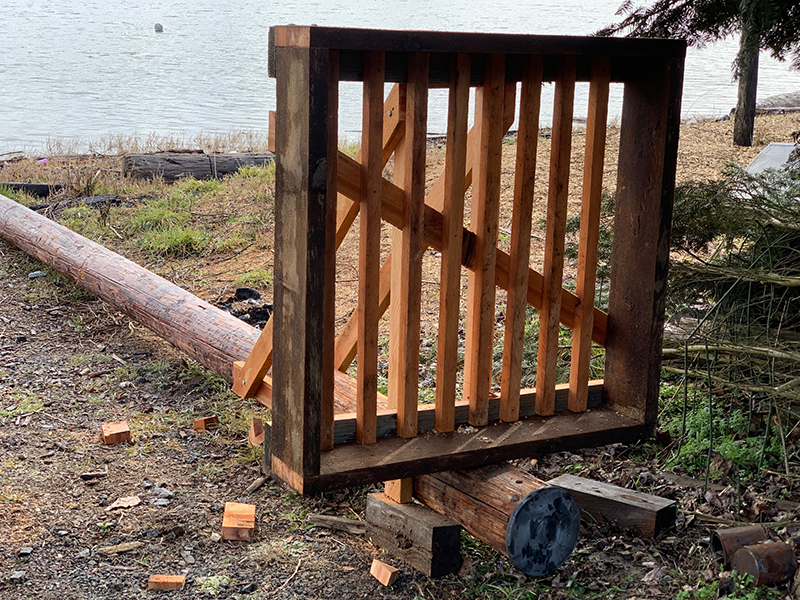 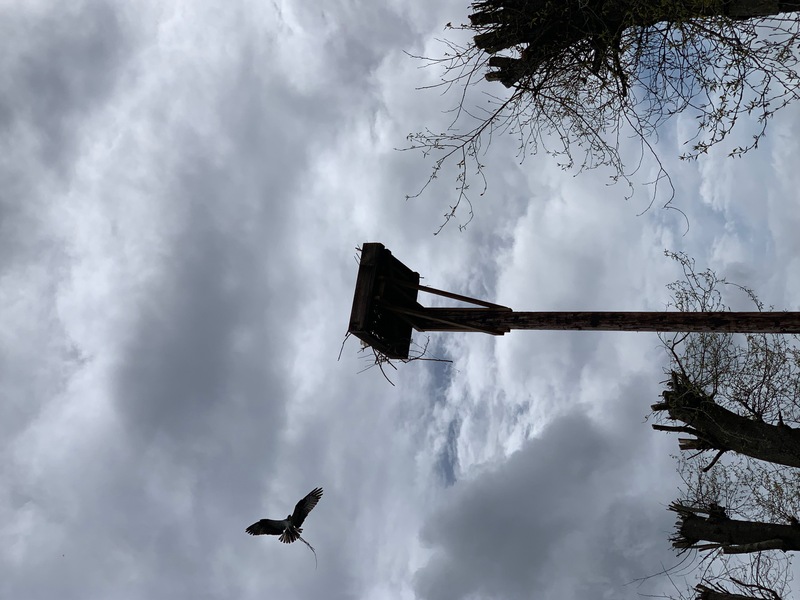 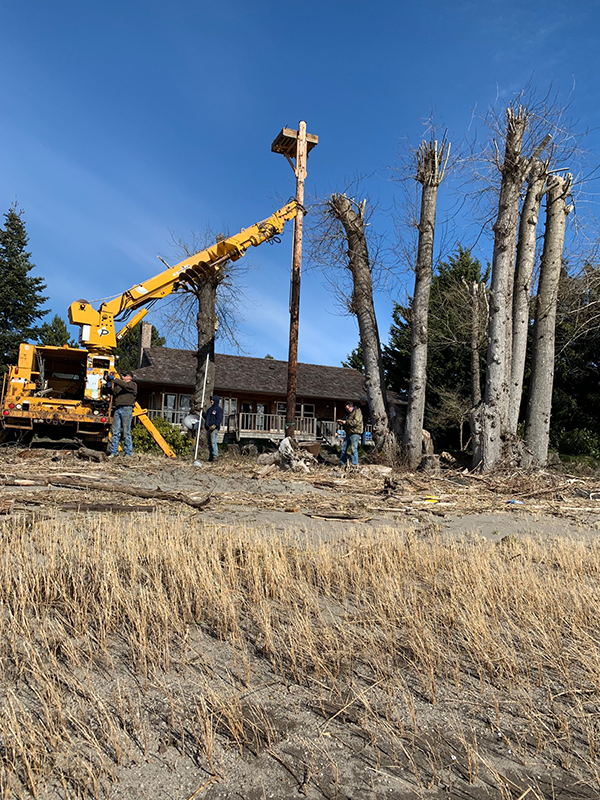 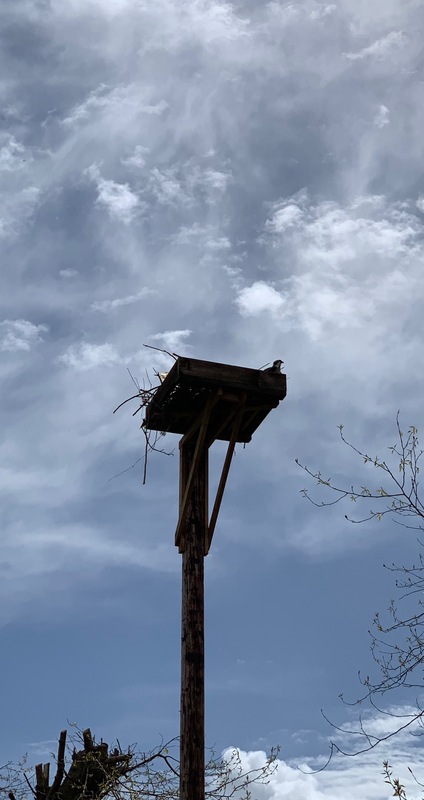 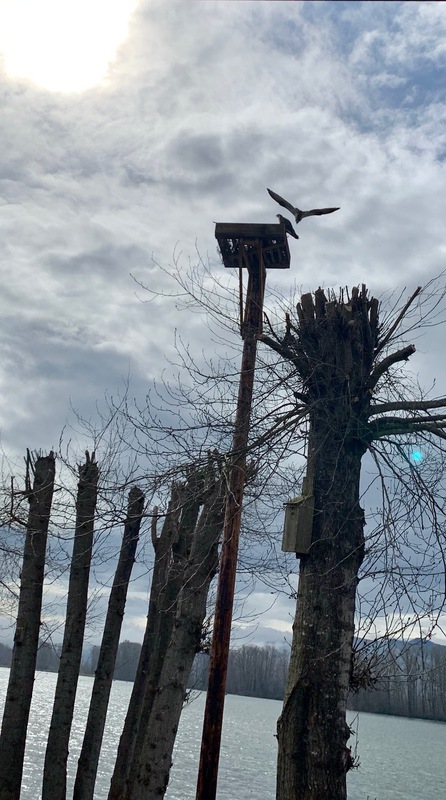 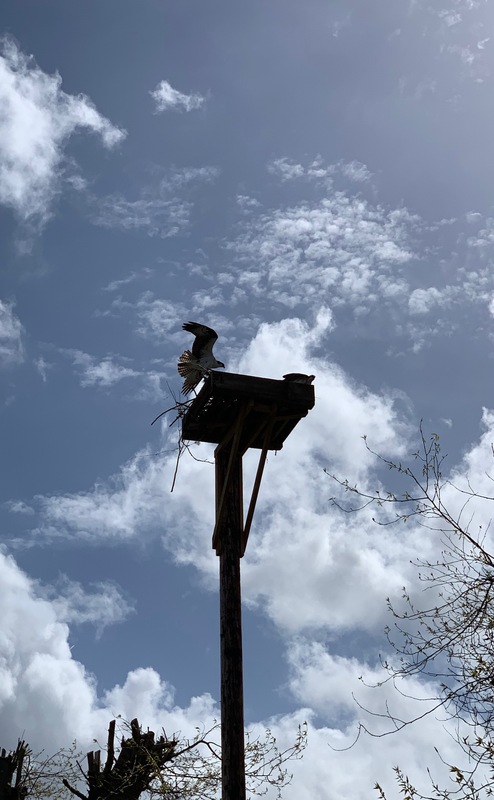 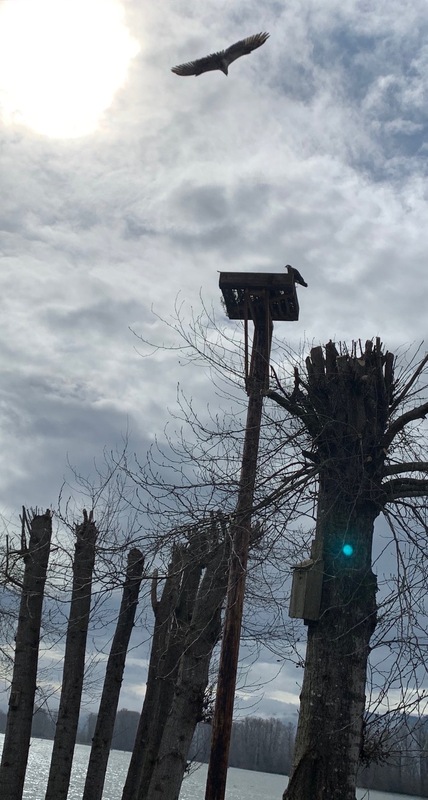 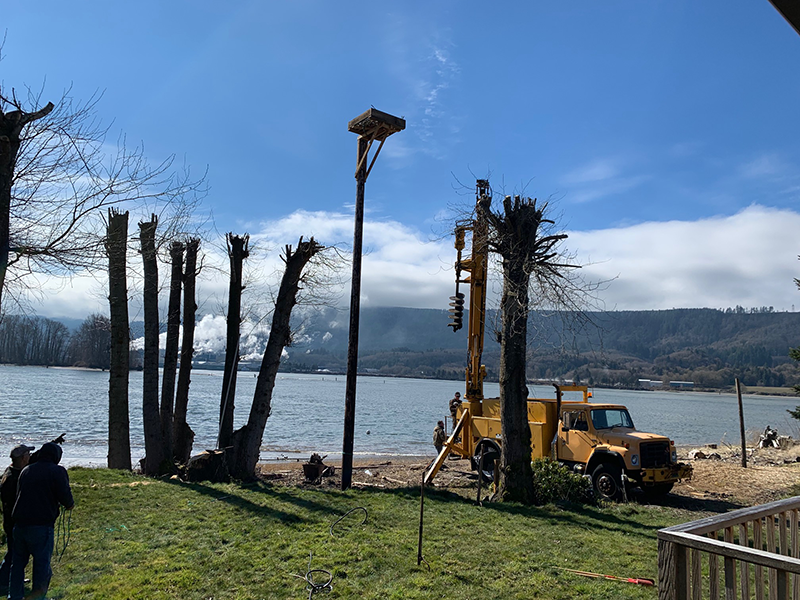 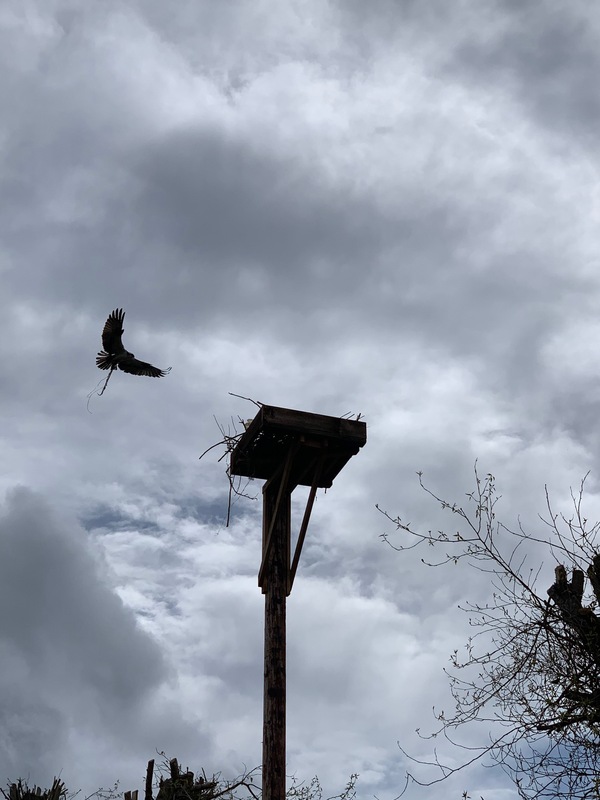 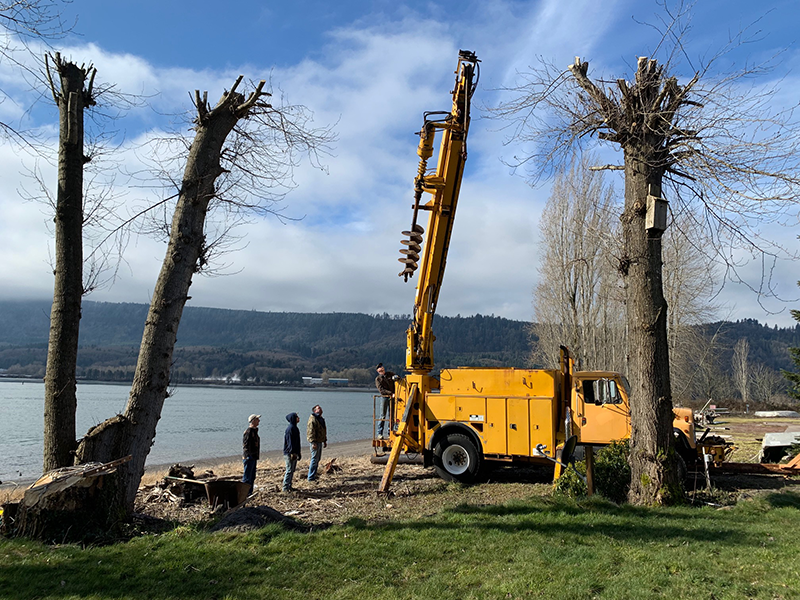 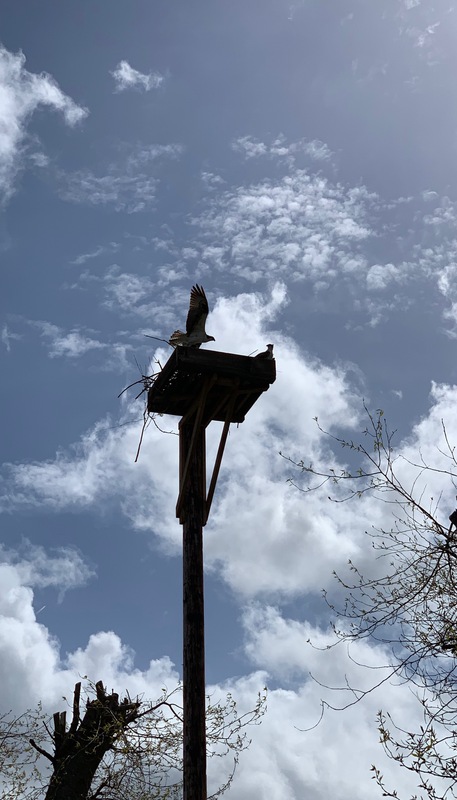 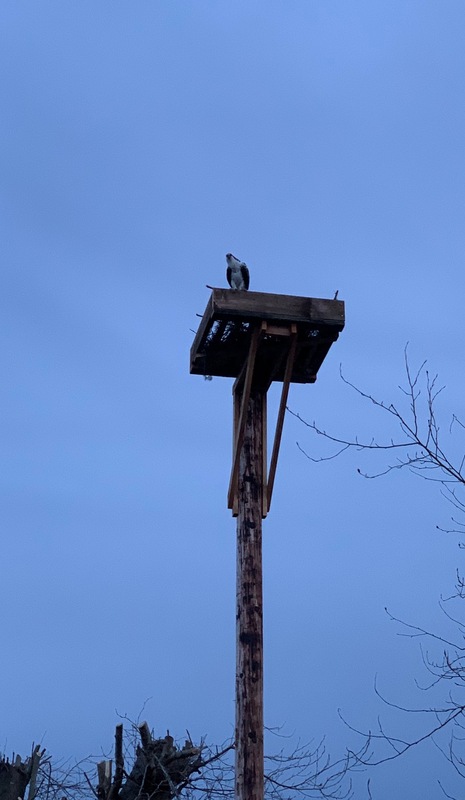 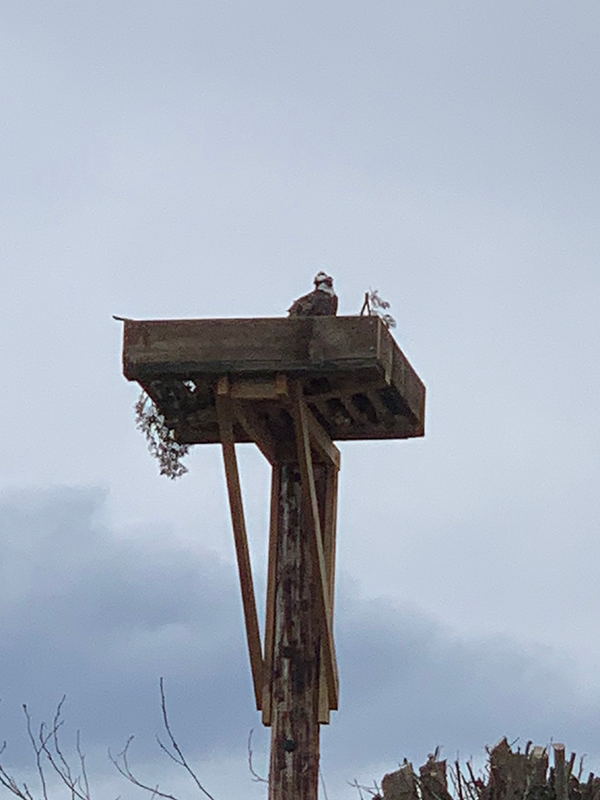 I had to quickly secure a power pole and build a new platform before the Osprey couple returned for this nesting season. 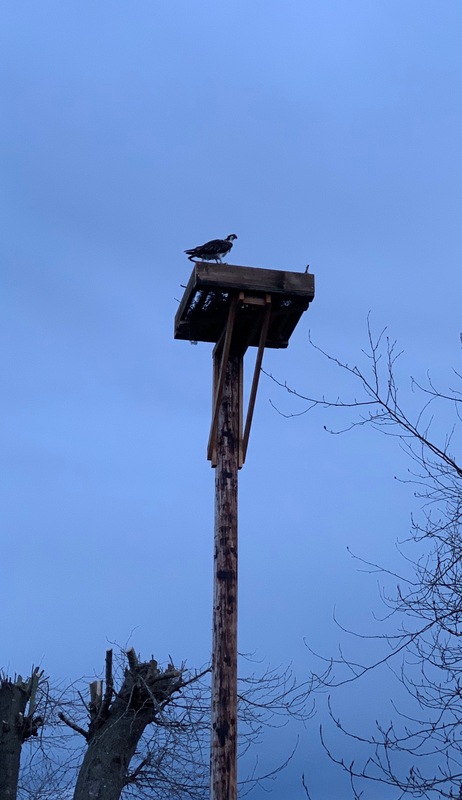 I planted it approximately 8’ away from the original, and it is also 10’ shorter, so my concern was whether the couple would accept it. 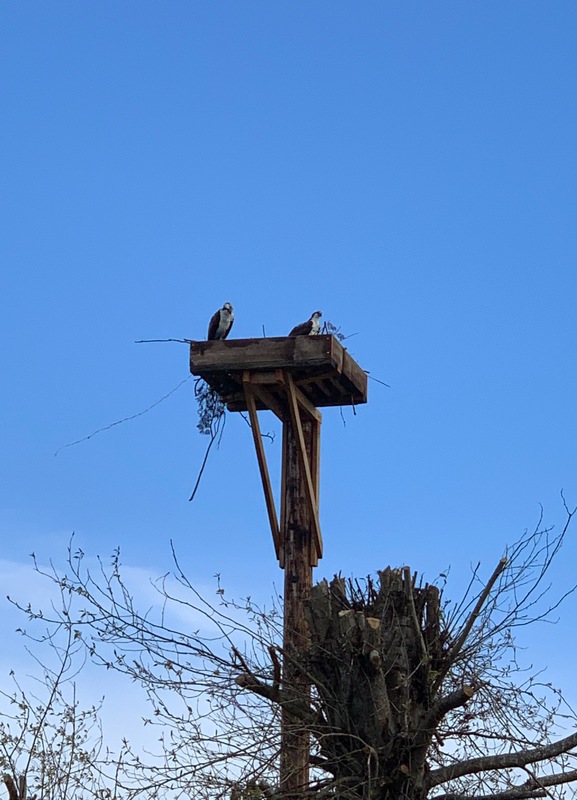 It will be interesting to see if the pair starts adding branches. 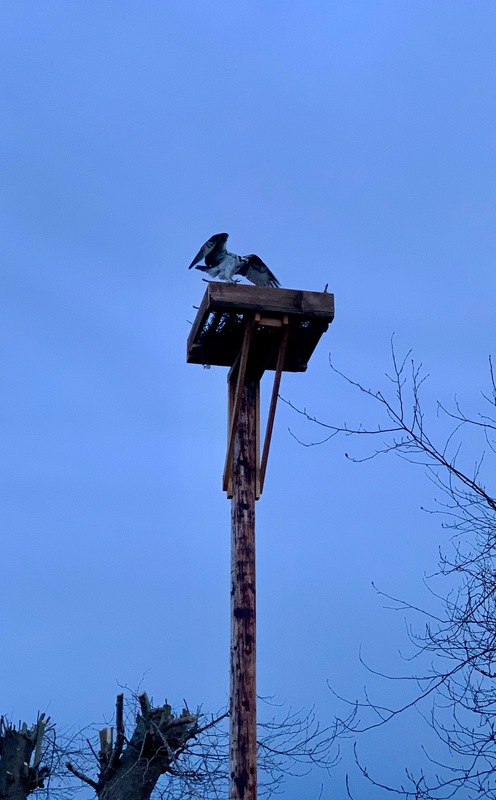 I’ll keep you post as thing develop. 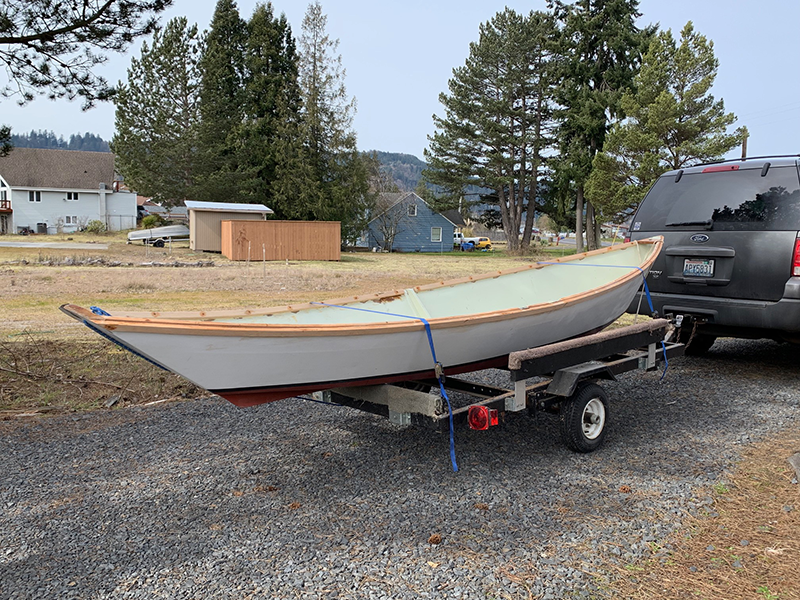 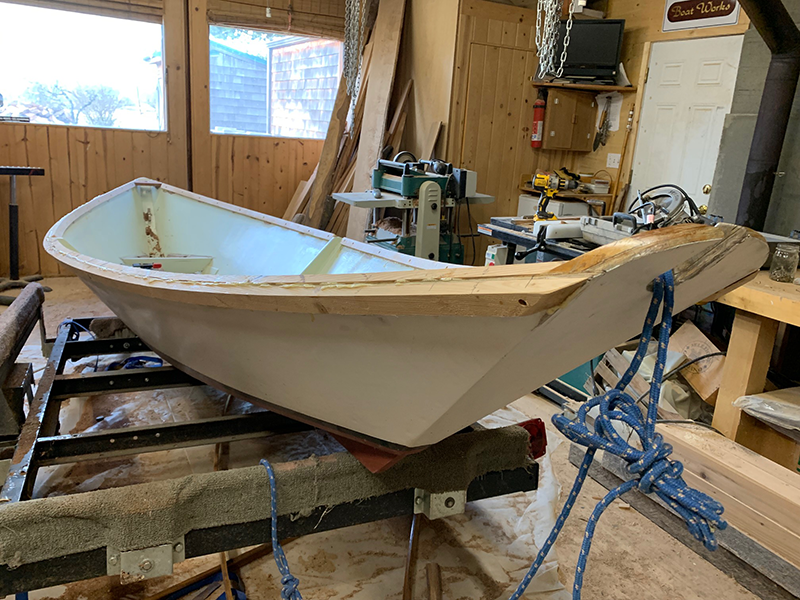 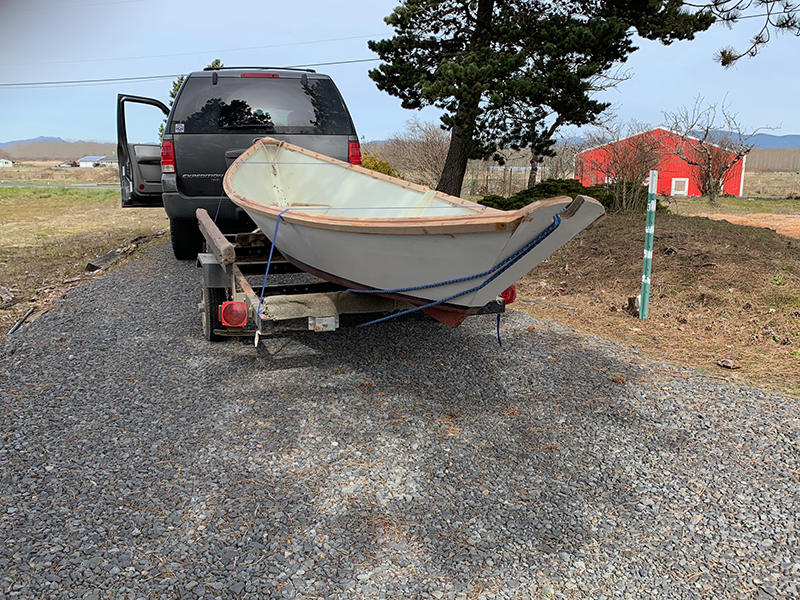 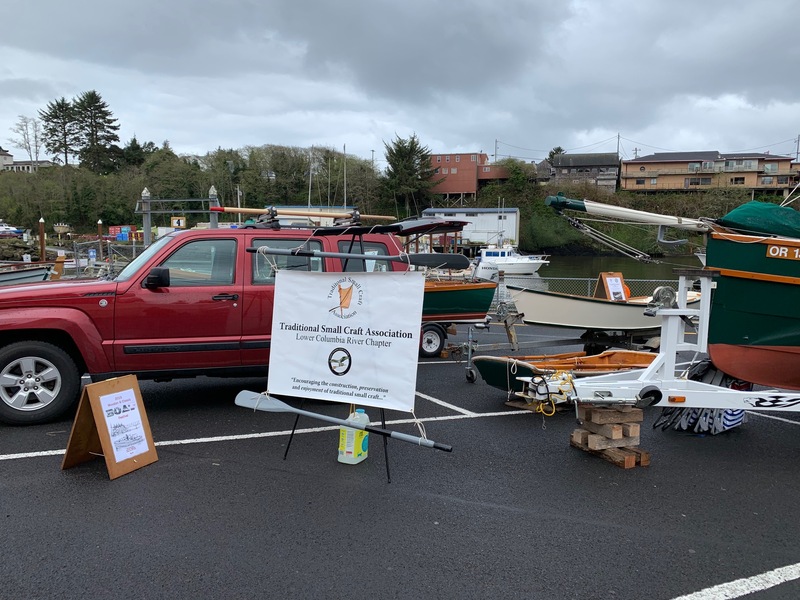 Today I finished my part of replacing the gunwale guards and adding the inwales to this sweet little 16’ rowing Dory! 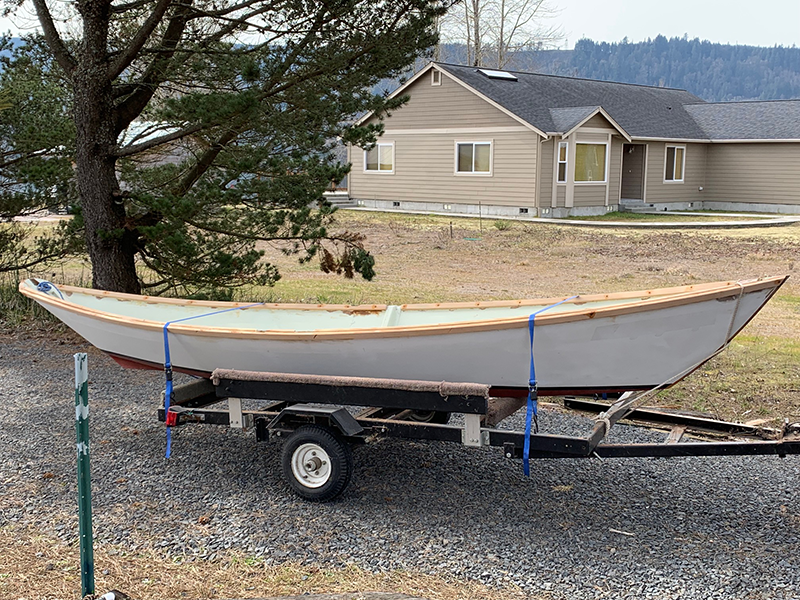 The owner will take her home, sand her smooth and give her a compete paint job in and out. 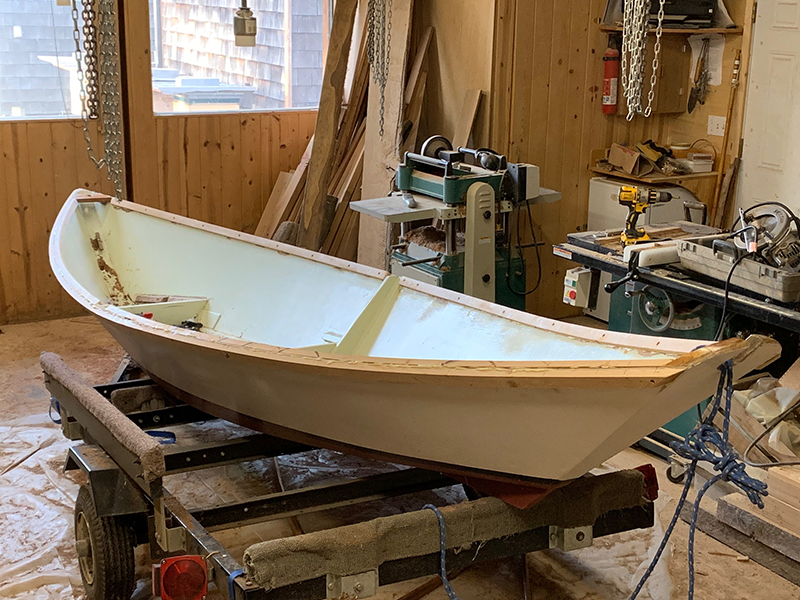 Yesterday I started on a friends little 16’ Dory. 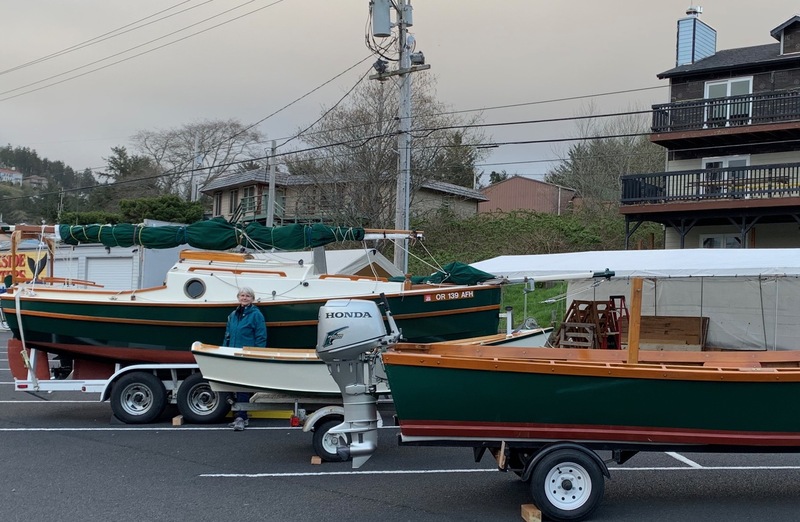 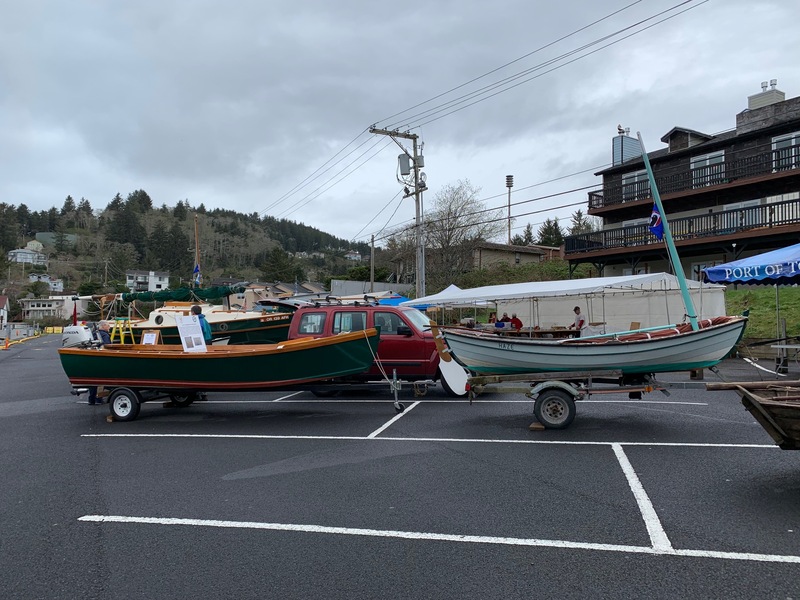 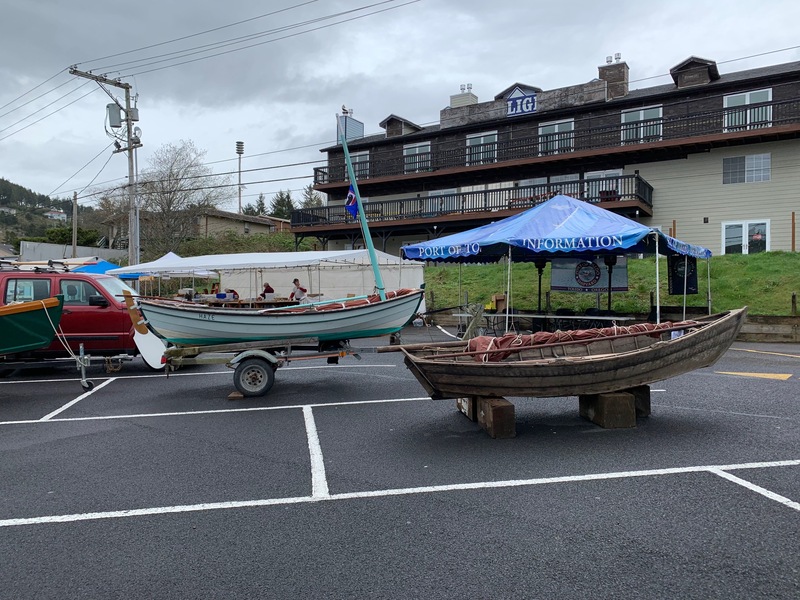 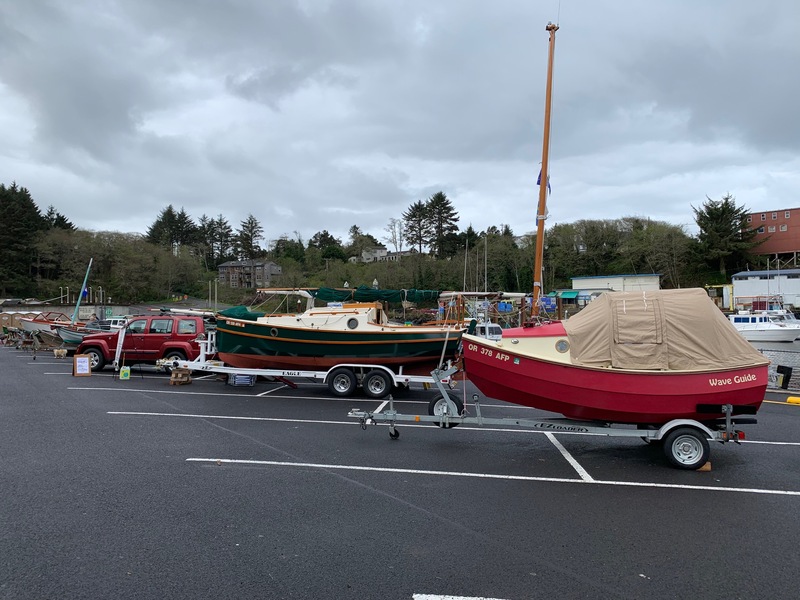 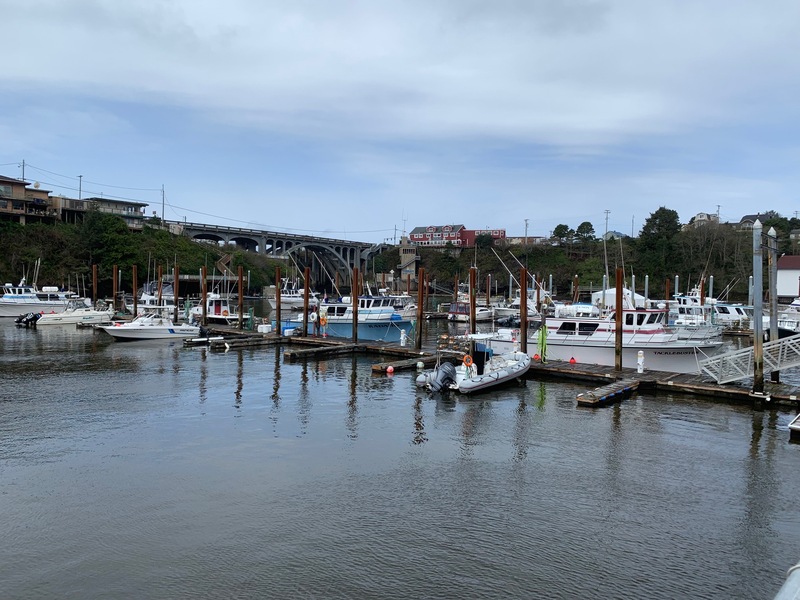 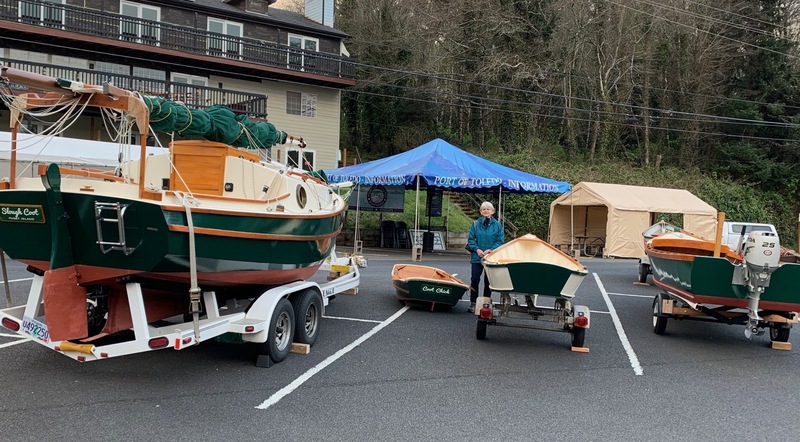 It had only gunwale guards, and both were scarfed and both scarfs had popped. 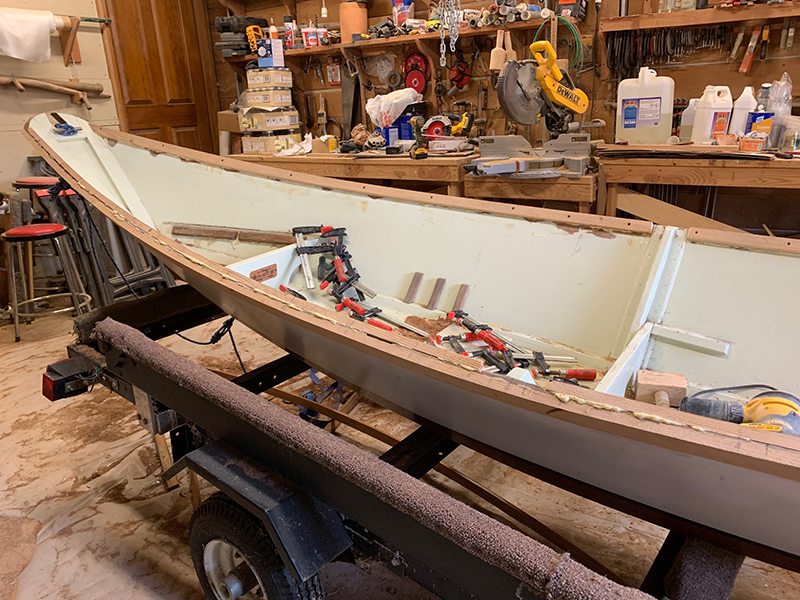 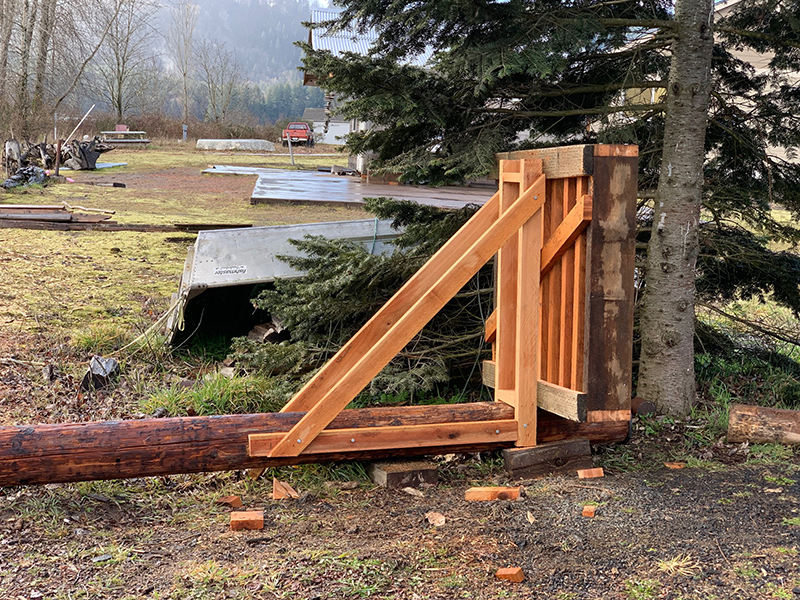 So I removed them, cut 4) 18’ full 1”x1-1/2” fir boards to not only replace the gunwales but also to add inwales for added sheer strength. 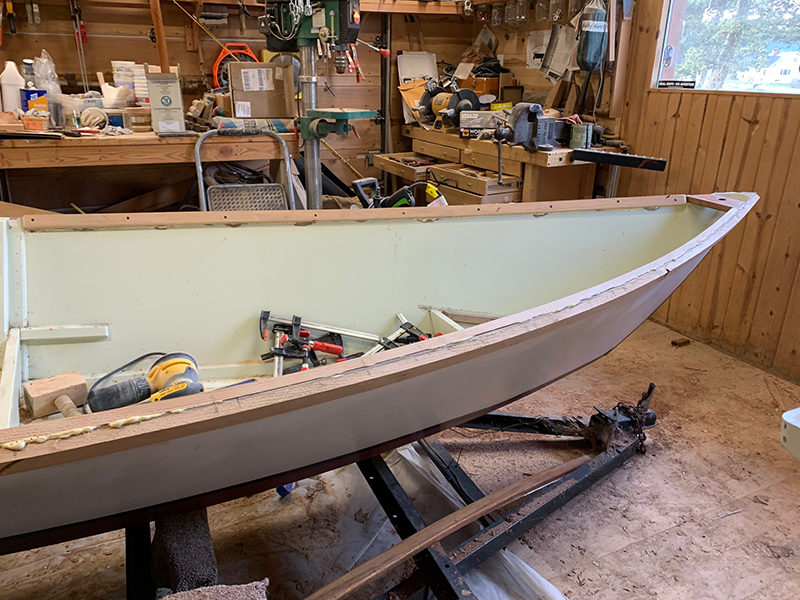 Today I fit the full length gunwale guards and inwales. 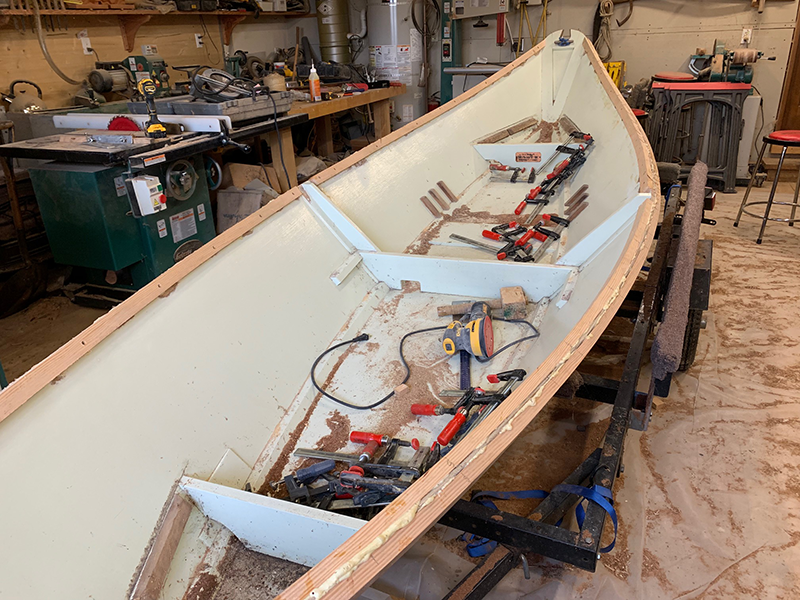 Tomorrow I’ll clean up the glue, fill the counter sinks with epoxy bungs then send her on her way! 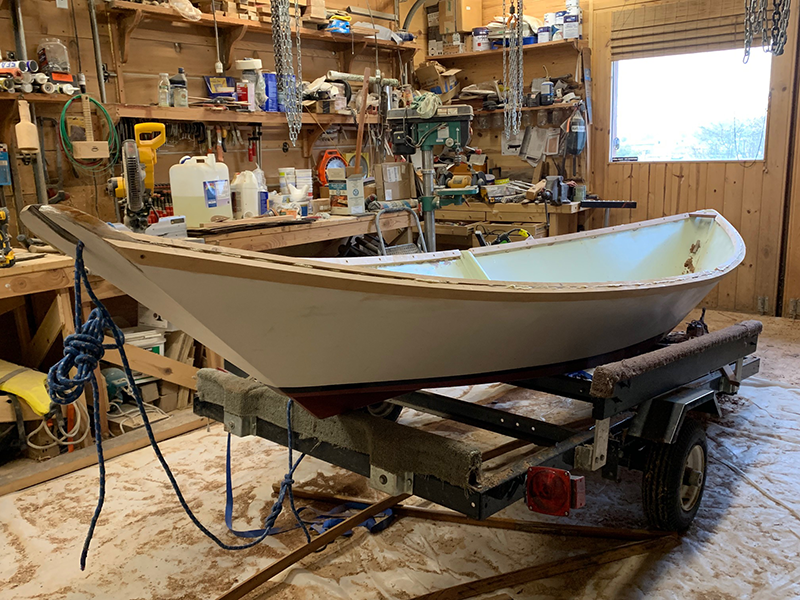 The owner plans on finishing her with fresh brightwork and a fresh coat of paint in and out. 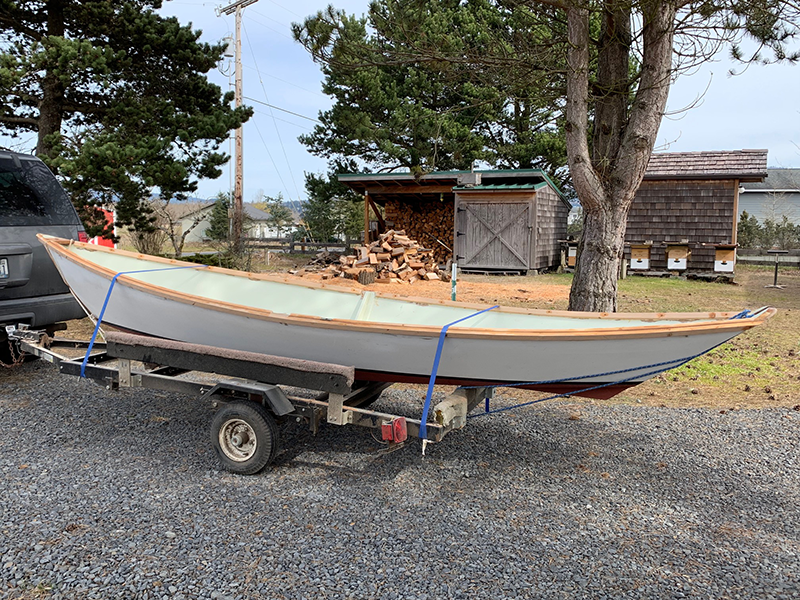 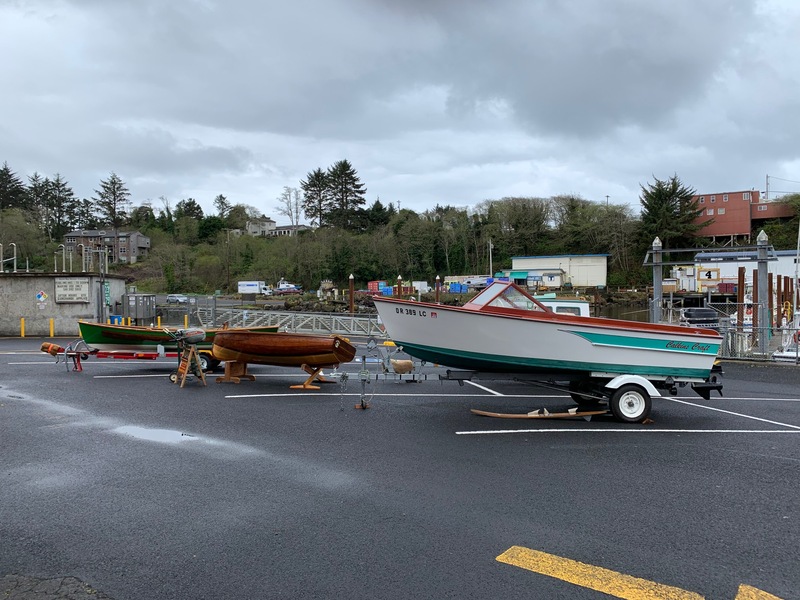 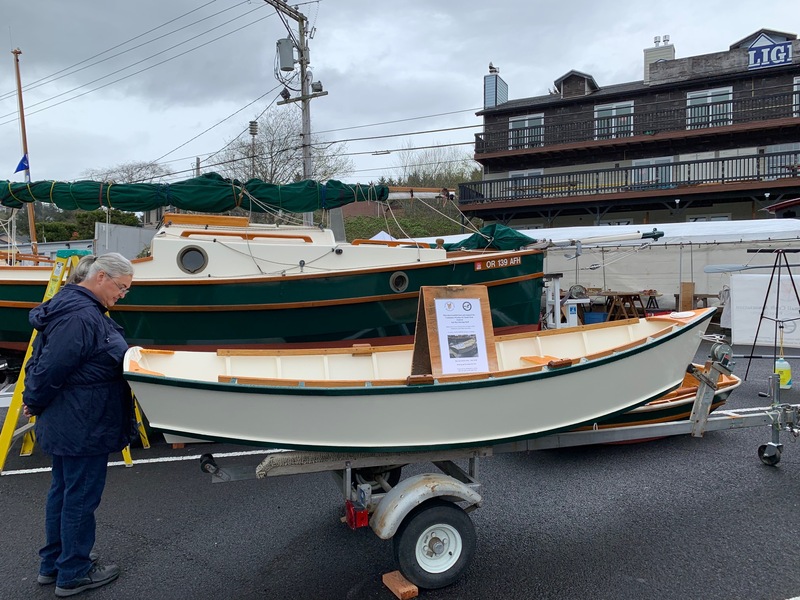 This little Phil Bolger design Dory has sweet lines. 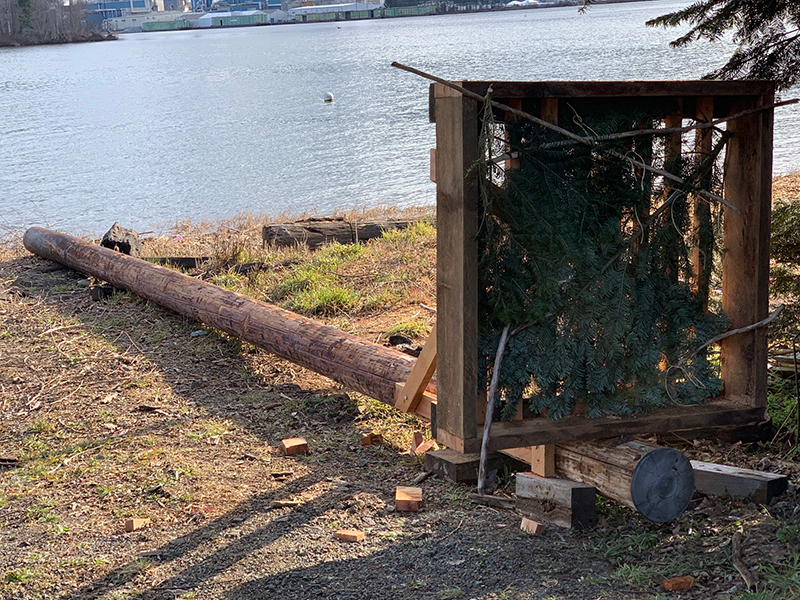 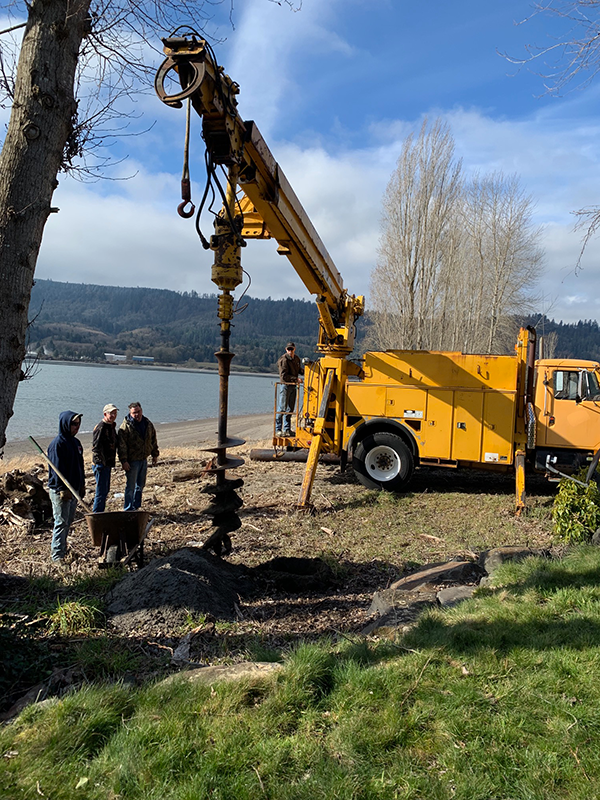 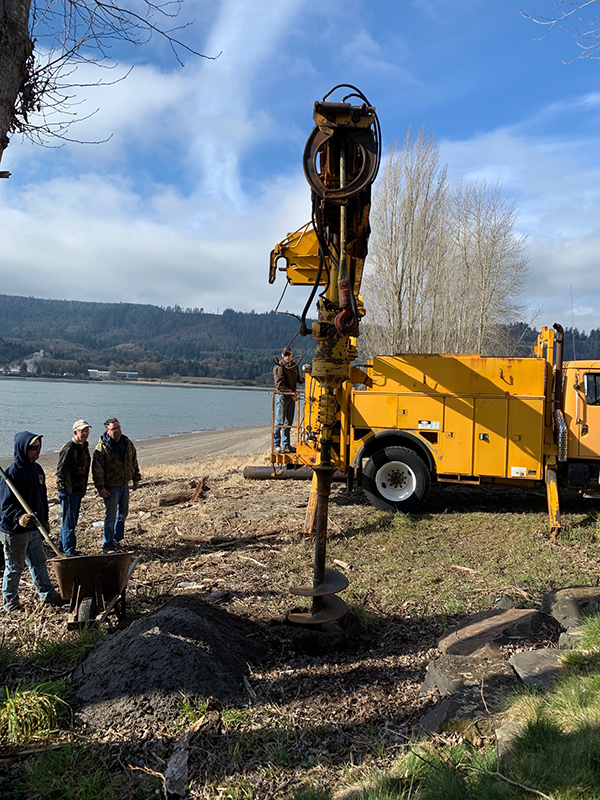 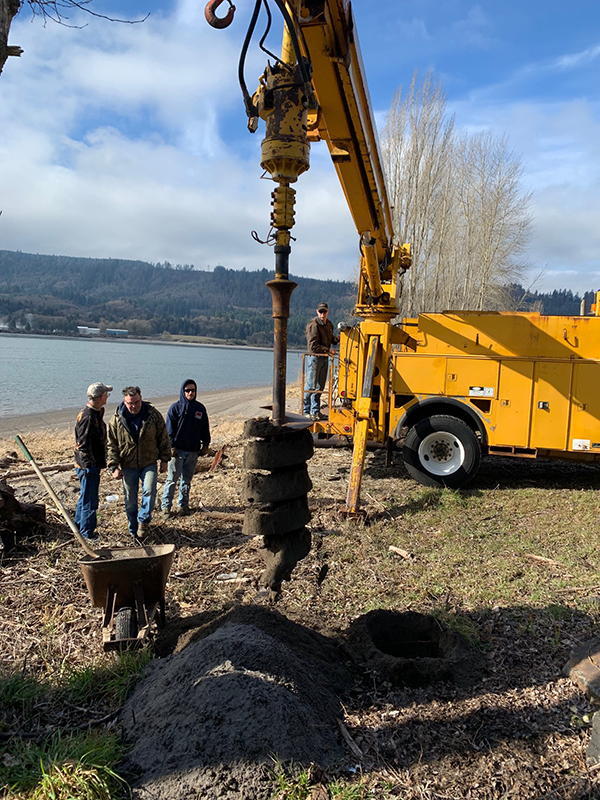 A few weeks ago we had a serious blower on Puget Island. 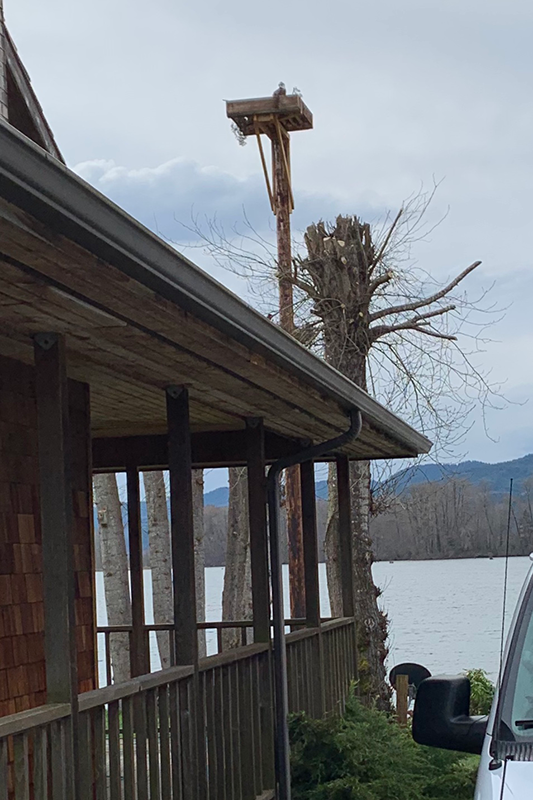 It was so bad that it blew the top 10’ of the tree and the Osprey platform down. 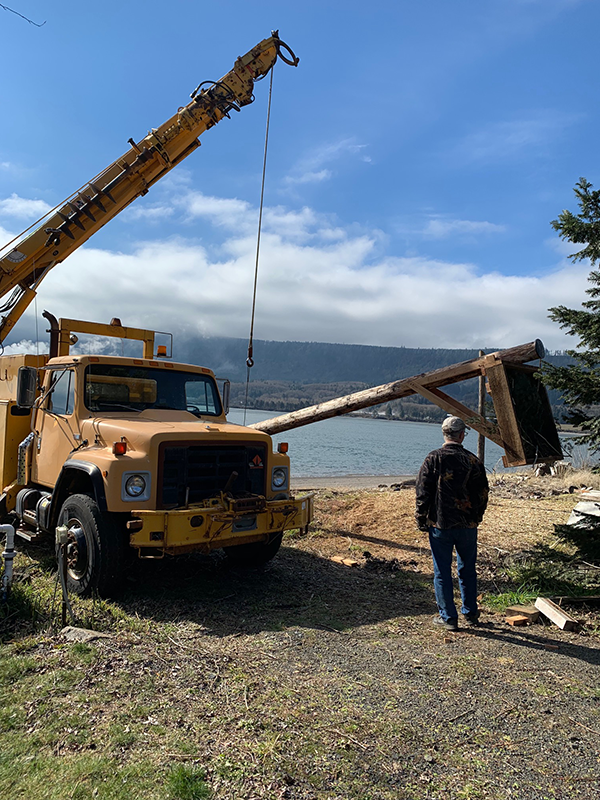 The tree was badly rotted so I had it removed. 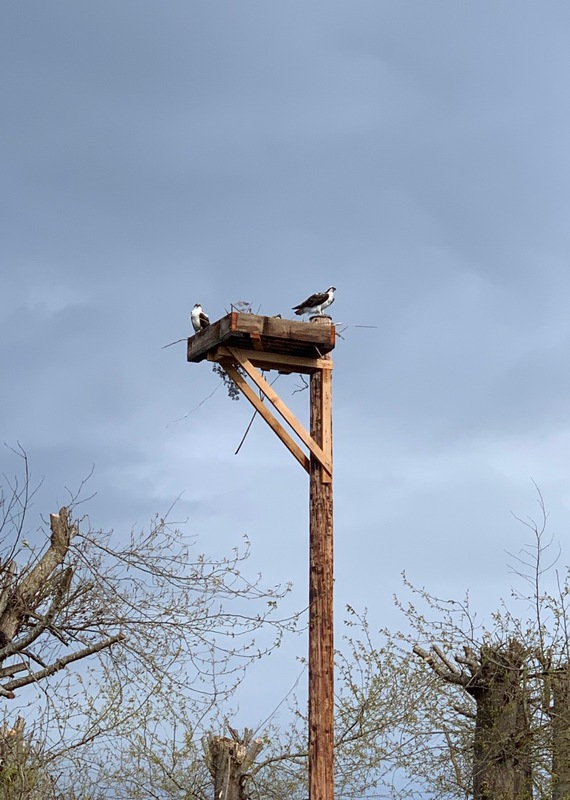 This is a problem because in less than three weeks my Osprey pair will be returning to their platform to begin a new family! 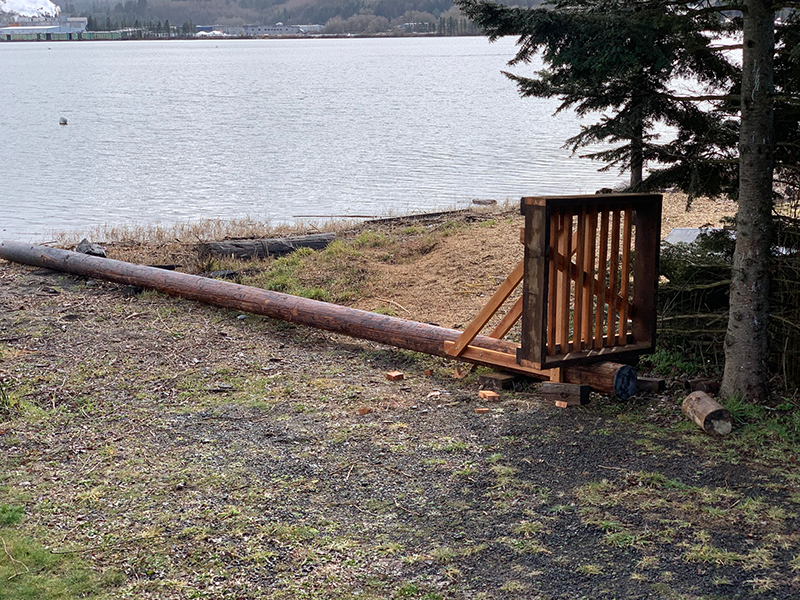 So for the last month I’ve been scrambling to get a proper pole, build a new platform and have it up and ready before their return. 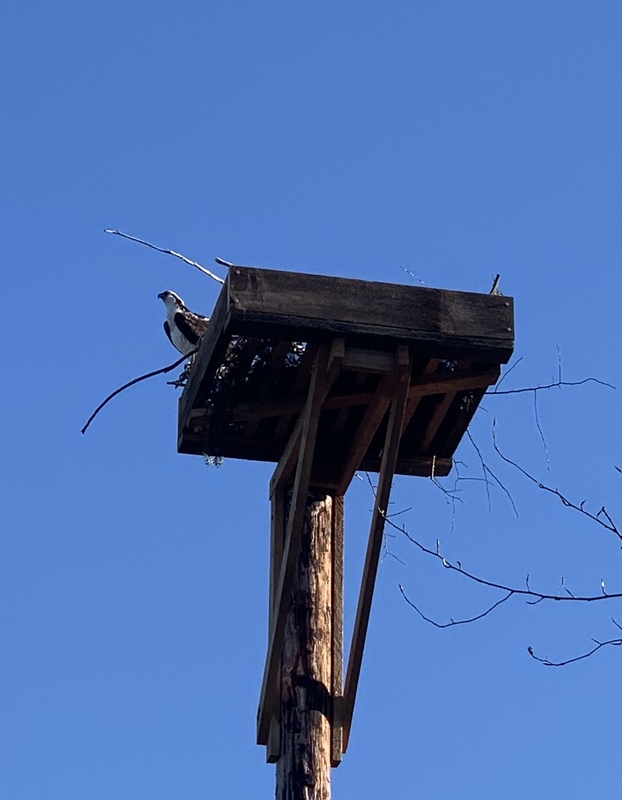 You can see I’ve started their nest with some soft spruce bows and a few sticks. 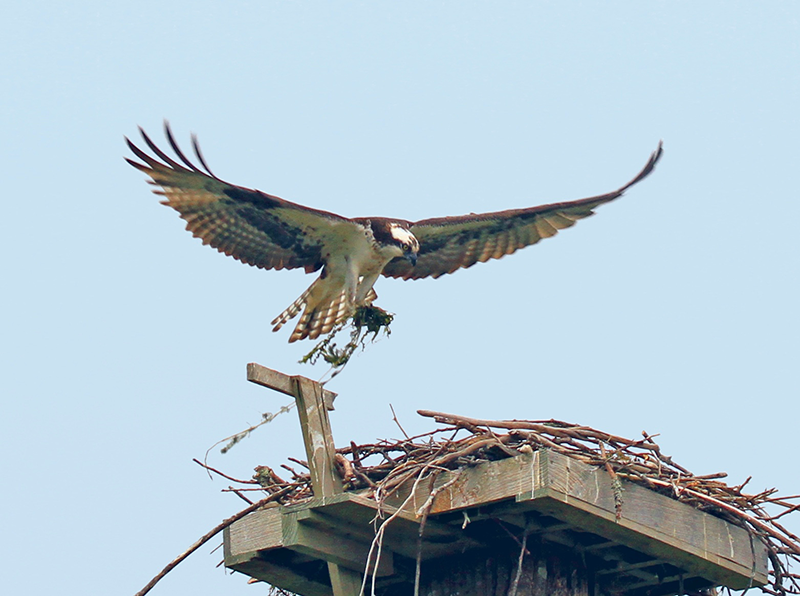 This is called salting the platform so the Osprey pair will take to it. 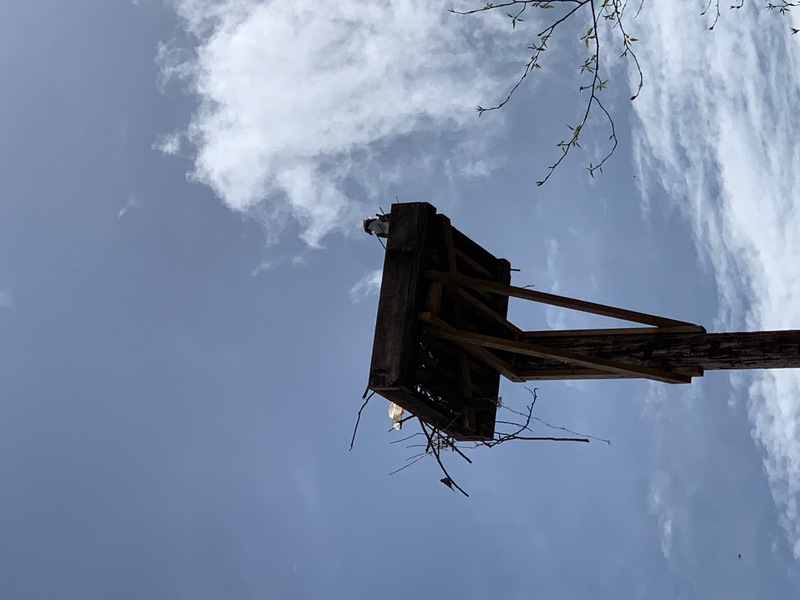 the old platform. 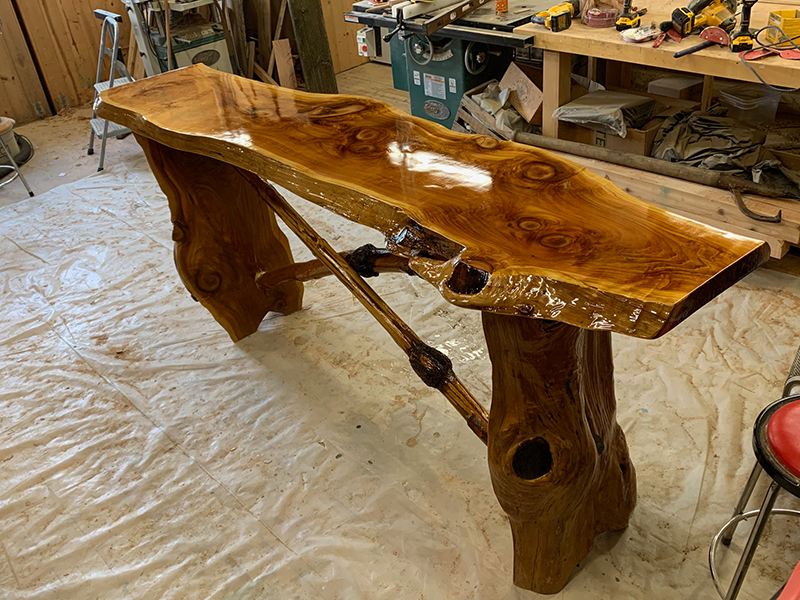 Once it is up I’ll post more photos.